At least two people have been killed and dozens more injured in an explosion in the eastern Chinese port city of Ningbo, local officials say. 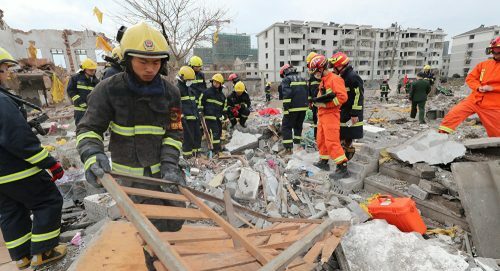 The blast is said to have occurred at a factory at about 09:00 (01:00 GMT) in the city’s Jiangbei District, causing some nearby buildings to collapse. State media reported that at least 30 people had been taken to local hospitals amid rescue operations. Footage showed rescuers carrying people away from an area surrounded by debris. Industrial accidents are common in China, and have prompted growing calls for better safety standards. The government says it has been tightening site inspections and toughening punishments for safety lapses. But while the number of workplace deaths in 2017 is reported to have fallen by more than 25% on 2016 – industrial fatalities still number at least 29,000 in the year to date. Police said on social media that an investigation was under way to determine the cause of the latest explosion. Ningbo has a large international shipping port and is best known for its auto-manufacturing industry, it is home to Geely – the Chinese owner of Volvo. Chinese media said the explosion happened in an industrial area, and residential buildings damaged nearby were already empty ahead of planned demolition. Some local reports suggested gas canisters could have been to blame for the blast. Shattered windows were reported in businesses up to 1km away from the site of the explosion itself.